Keywords: Low-cost CD4, CD4+ count, EasyCD4 assay, Guava Technologies, Inc, microcapillary flow cytometry, resource-limited setting. 1 Josefowicz SZ, Louzao R, Lam L, etal. Five-site evaluation of the Guava EasyCD4 assay for the enumeration of human CD4+ T cells [Abstract U-138]. Presented at: th Conference on Retroviruses and Opportunistic Infections; 2005; Boston. Bishai D, Colchero A, Durack DT. The cost-effectiveness of antiretroviral treatment strategies in resource-limited settings AIDS 2007; 21: 1333-40. Kassaye S, Renault CA, Israelski DM. Marlink RG, Teitelman SJ. Lower-cost laboratory monitoring for CD4 T-lymphocyte enumeration, HIV RNA quantitation and drug resistance In: From the Ground Up: Building Comprehensive HIV/AIDS Care Programs in Resource-Limited Settings Washi. The Elizabeth Glaser Pediatric AIDS Foundation 2009. Spacek LA, Shihab HM, Lutwama F. Evaluation of a low-cost method, the Guava EasyCD4 assay, to enumerate CD4-positive lymphocyte counts in HIV-infected patients in the United States and Uganda J Acquir Immune Defic Syndr 2006; 41: 607-10. Kandathil AJ, Kannangai R, David S, et al. 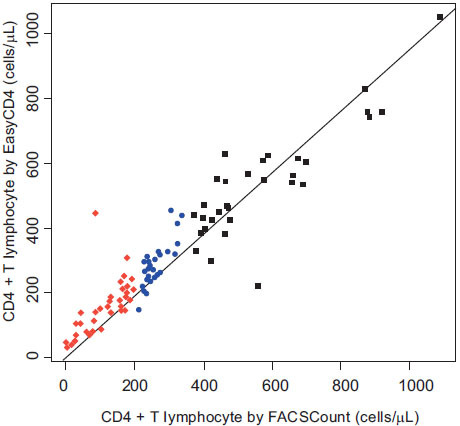 Comparison of microcapillary cytometry technology and flow cytometry for CD4+ and CD8+ T-cell estimation Clin Diagn Lab Immunol 2005; 12: 1006-9. Pattanapanyasat K, Phuang-Ngern Y, Lerdwana S. Evaluation of a single-platform microcapillary flow cytometer for enumeration of absolute CD4+ T-lymphocyte counts in HIV-1 infected Thai patients Cytometry B Clin Cytom 2007; 72: 387-96. Balakrishnan P, Solomon S, Mohanakrishnan J, et al. A reliable and inexpensive EasyCD4 assay for monitoring HIV-infected individuals in resource-limited settings J Acquir Immune Defic Syndr 2006; 43: 23-6. Thakar MR, Kumar BK, Mahajan BA, Mehendale SM, Paranjape RS. 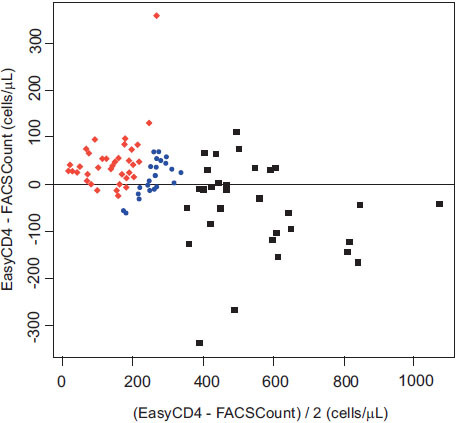 Comparison of capillary based microflurometric assay for CD4+ T cell count estimation with dual platform flow cytometry AIDS Res Ther 2006; 3: 26. Kassaye SG, Ndayishimiye F, Binswanger H, Sall AY, Machekano R, Israelski DM. Association-driven care and treatment: a model for community-based delivery of HIV/AIDS healthcare in resource-limited settings AIDS 2006; 20: 1561-70. Guava EasyCD4 System User’s Guide Guava Technol 2004. BD FACSCount System User’s Guide for Use with BD FACSCount CD4/CD3 Reagents Catalog #3 2005. Bland JM, Altman DG. Statistical methods for assessing agreement between two methods of clinical measurement Lancet 1986; 1: 307-10. Cheng X, Irimia D, Dixon M, et al. A microchip approach for practical label-free CD4+ T-cell counting of HIV-infected subjects in resource-poor settings J Acquir Immune Defic Syndr 2007; 45: 257-61.